Crispy oven baked cod coated in Salt & Vinegar potato chips! People love malt vinegar with fried fish. And I do too! Go to any fried seafood place and you’ll see bottles and bottles of it everywhere. And there’s some logic to it, actually. The reason folks pair fish with vinegar (and lemon juice) is because of the whole acid/base thing. You need the acid from the vinegar or lemon to cut the amines (bases) in the fish. It’s all just plain ol’ chemistry. Mrs. Ross, my high school chemistry teacher, would be so proud of me. And she might even forgive me for laughing when that ceiling tile fell on her head. With the six gallons of water behind it that caused the ceiling to collapse. So anyway, I got to thinking about that one night. Because doesn't everyone lie in bed at night thinking about acids and bases and lemons and fish and vinegar and high school chemistry teachers and flooded ceilings? I’d been wanting to try my hand at baking some crispy fish. My peoples love fried fish. And my peoples love fish sticks. So I was trying to think of a way to schmoosh those two things together when I thought about using crushed potato chips. And you know what thought came next, right? Salt-and-frickin-vinegar potato chips. It was meant to be! Potato chips with vinegar on fish. I mean, come on?! That’s too perfect! So I tried it. And it was amazing! Like, it really, really was amazing. The fish was crazy crunchy! I used an egg wash to help promote the crunch and it didn't let me down! Now, I know some of you are going to tell me you don’t like hot sauce and ask what you can substitute but hear me when I tell you: this is not spicy. At all. You know what hot sauce is made out of? Vinegar. So we’re getting another layer of vinegar in there. But just to be clear: this. is. not. spicy. And, believe it or not, this doesn't have a strong vinegar taste. It’s just right. There’s just enough to know it’s there without knocking you in the teeth about it. Blot fish fillets dry with paper towels then season both sides with salt and pepper; set aside. Crush potato chips. I started out smashing mine old school with a meat mallet but wasn't getting anywhere very fast so I switched to a food processor which made quick work of the task and resulted in nice even-sized crumbs. Place potato chip crumbs in a shallow dish; set aside. Beat eggs with hot sauce and place in a shallow dish; set aside. Line a baking sheet with aluminum foil. Place baking rack atop foil then spray with cooking spray; set aside. Dip one fillet in egg wash and let excess drip off. Place fillet in potato chips and press down to get a good coating. Flip the fillet and coat the other side as well. Use a spoon or fork to bring potato chips up to coat the edges of the filet. Arrange fillets on the prepared baking rack. Rinse and repeat until all fillets are coated. If you don’t have a baking rack, just cook fillets on a baking sheet sprayed with cooking spray but do not coat the bottom of the fillets with chips. The fish will put off moisture as it cooks which will make for a soggy mess on the bottom if you coat it with chips and then lay directly on the baking sheet. 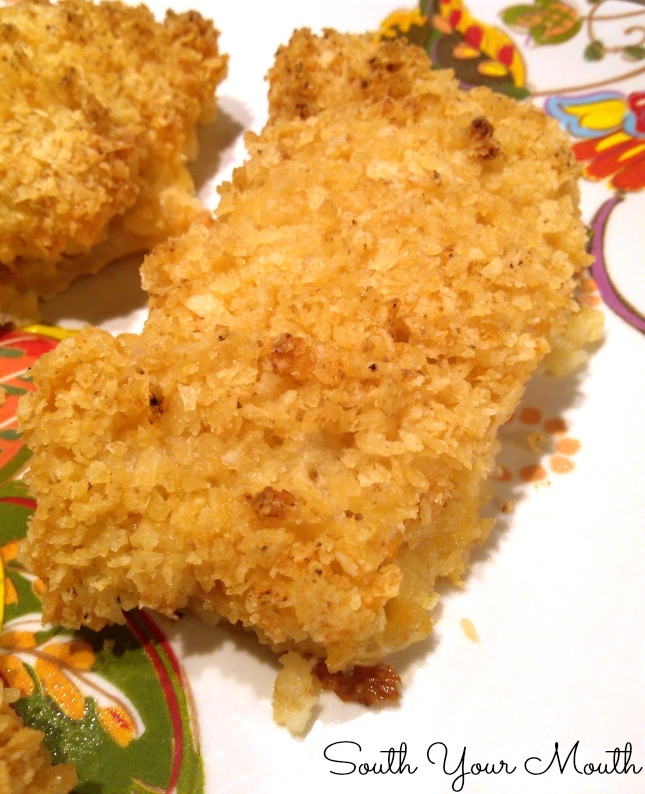 Bake fillets at 400 degrees for 20 minutes or until fish is cooked through and potato chip coating is golden brown. Cool for 5-10 minutes before serving. I love S &V chips! Can't wait to try this, and don't know why I didn't think of it. I have an old recipe where you mix lemon juice and bbq sauce, dip catfish in it then cover in crushed bbq Potatoe chips and bake. It's awesome, so this will be even better. Love you and all your stuff! I make a similar dish using Talapia. Put the fillets in a dish lined with nonstick foil. Spread a thin layer of mayo on top of each fillet then put the crushed salt and vinegar chips on top and press down. Bake at 400 degrees for about 12 to 14 minutes, depending on how thick your fillets are. It is delicious. Awesome recipe, the entire family LOVED it! I would not make this recipe with thinner fillets (e.g. tilapia) as the crust would be too thick but is perfect on the cod. Thank you so much! I found this recipe forever ago on your Facebook page. We make this with swai fillets, halved. My son calls it "pickle fish" and requests it regularly! Would this work with Pringles salt and vinegar chips?